Beginning with her early days on the scene in SoCal, comedian Margaret Cho has always been the Agent Provocateur of stand up. Never one to shy away from a difficult, or even 'taboo' topic, there is no subject off limits. Her socially aware brand of comedy has made her both a thought leader as well as a teacher to those with open minds and open hearts. An accomplished performer in all formats, Cho could be called the “Queen of all Media,” having conquered the worlds of film, television, books and theatre. She has three Grammy Award nominations for Best Comedy Album under her belt. Her tours sell-out, and she’s had two shows debut Off-Broadway (I'm The One That I Want and The Sensuous Woman). She has made an indelible mark in television, starting in 1994 with the network comedy All American Girl, followed by one of the first “reality sitcoms” to air on VH1, The Cho Show and most recently starring in the Lifetime series Drop Dead Diva for all six seasons. The film and DVD releases of her stand up have broken records – literally, with I'm The One That I Want holding the title for ‘most money grossed per print’ for an independent film. Her other releases, which Cho fans collect and swap with zeal, include Notorious C.H.O (2001), Assassin (2005), Revolution (2003), Beautiful (2009) and Cho Dependent (2011). Since 1999, Margaret has been responsible for the distribution and sale of all her content. Cho also played North Korean leader Kim Jong Il on 30 Rock, which garnered her an Emmy nomination for Outstanding Guest Actress in a Comedy Series. Along with writing and recording a follow up to the Cho Dependent music album, Margaret set out on tour with her show, Mother, which began in late summer, 2012 and included both a US and European Tour. Equally as important to her as her work in entertainment is the causes she is passionate about. Margaret has been widely recognized for her work in the non-profit sector, lending her name, time and tireless work ethic to several charities, especially those involving gay rights and anti-bullying campaigns. In every segment of her life, Margaret is honest, adoring, passionate, uproarious and always entertaining. 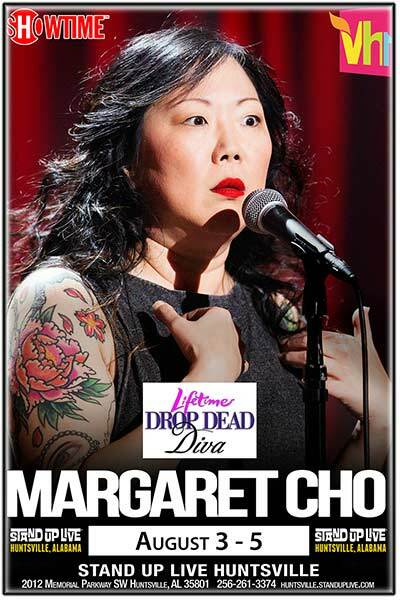 Margaret Cho is at her very best.